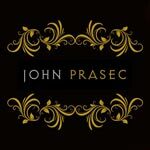 John Prasec is a hard rock singer, composer and songwriter from Italy, releasing his self titled E.P. in 2014. John has been around the music industry for years, making a name for himself in his home country of Italy, where his unique voice and amazing stage presence has earned him the nick name "The Voice Of Rock" by his legions of fans. Relocating to the UK in 2012, John has been working with a number of musicians from the rock and metal genres to create his debut release as a solo artist, the self titled mini album. Featuring five songs of hard hitting, hard rock, the album opens with the striking 'Give Me Your Heart'. Pounding rhythms and superb guitar work produce a foot stomping song of immense power with very strong vocals. With touches of both the British and American rock sound, 'Give Me your Heart' is guaranteed to "get the party started". 'Sweet Case' introduces a blues influence and the versatility of John's voice is awesome as it changes tone and suits the sound of the song perfectly. You can just visualise John strutting around the stage in an American bar room with the entire crowd going wild. With a song titled 'God Save Rock And Roll' you would expect it to be a huge anthemic style song...and you will not be disappointed. Rocking like a souped up American muscle car, 'God Save Rock And Roll' is catchy, infectious and above all, a bloody cracking hard rock song. Great vocals, great guitars and a blistering solo. The first single off the album is the superb, heavy guitar driven 'Seventeen' that has touches of old English punk rock about it. A catchy sing a long chorus and a chugging rhythm will have your head nodding hard in appreciation of what is an anthemic party style romp. The intensity and tempo of 'Light Master' is more akin to the power metal genre that hard rock. 'Light Master' swaggers its way through an intense rhythm and buzzing guitars to bring this album to a close in a blaze of glory. A varied and intriguing mix of songs, this debut release is a superb appetiser for "please sir, can i have some more?". Overall, hard hitting and hard rocking, this is five songs of pure, in your face, swaggering heavy rock. Superb guitars and vocals, this is a must listen.